Once again we find ourselves in Ephesians. The church in Ephesus was in the midst of a large, thriving, metropolitan city. It was a great cultural center back in Jesus’ time, and I imagine that the members of that newly formed Christian community in Ephesus had choices to make about how they were going to live their lives in the midst of this city where so many philosophies, theologies and worldviews came together. Perhaps given this, the letter to the Ephesians reads somewhat like a moral and spiritual guidebook. …root themselves in love, to grasp the breadth, length, height and depth of Christ’s and God’s love. …say things that build one another up. Get rid of all bitterness, all rage and anger, all harsh words, slander and malice. Be kind, compassionate and mutually forgiving. Today we hear the author implore people to pay attention to their conduct. Don’t act like fools, but like wise and thoughtful people who are striving to discern "God'd will" for their lives. So, let’s start here: what does it mean to live foolishly? My first thought was how foolishly we live when we go on auto-pilot and don't really experience life. We can add a number of things to that including: being selfish or greedy, being judgmental or harsh with our words. To get caught up in the illusion and drama of the world is also foolish, as is living without loving. If to live wisely is to discern the will of God in everything we do, what exactly does that mean? 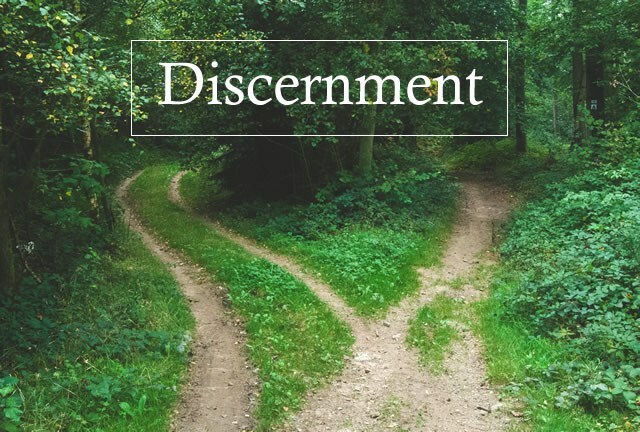 By definition, discernment is "perception without judgment and with a view of obtaining spiritual direction and understanding. It is the ability to grasp and comprehend what is obscure." It is also the ability to see things as they really are, not what we want them to be. Often when I’m working on a sermon I do some research online to see what others have said. To be honest with you, what I found didn’t fit for me. I struggled so much with it that I wrote two drafts of this sermon and was still unhappy with it. Finally, Saturday morning I figured out why. A few weeks ago I preached on "Growing Up" and the stages of faith and it occurred to me that discernment could be different in different stages. I believe that the majority of bloggers or writers were talking about discernment for people in stage one and two. Stage 1 and 2 are the mythic-literal, institutional stages. In these stages one accepts and understands the stories of faith very literally, and one believes in God “up there” and “out there." The institution is relied upon for answers and stability, and one is very attached to doctrine and liturgy. Personally, I don't believe in the “infallible word of God,” I take scripture seriously, not literally. So, that doesn't work for me. And how exactly does one become anointed by the Spirit? God's grace is everywhere at all times, but how does that help to discern God's will? And, even if you pray for it (which is not necessarily a bad thing), how do you know you’re following God and not your own ego? STAGE 3 is the questioning, skeptical, individual stage where one critically examines all of their beliefs and religious/spiritual experiences. One can now think outside of the box and even see that there are other boxes. It isn't uncommon for a person in stage 3 to be an atheist or agnostic. Frankly, I think discernment for this stage is tough. If you don't really believe in God, how can you believe in the will of God? In stage 3 the more questions one asks, the more questions one has. A person either gets stuck in that cycle and frustrated because the answers aren't clear, conclusive, and forthcoming. Or a person learns to be okay with the questions and moves into stage 4. STAGE 4 is the mystical, non-dualistic, communal stage where one recognizes the connectedness of all things, is okay with mystery and "I don't know." Sacred story and symbols are accepted without succumbing to a box mentality. God is immanent and within one's very self, and there is an emphasis on community. Discernment for this stage begins by understanding that God is in all things – all things are holy. This is perhaps the ultimate discernment. When we all know this, and live our lives in alignment with this, our actions change. The way we treat ourselves, our family, friends, the earth, creatures, refugees, the poor, prisoners, children, disabled, and so on, changes because we know we are all connected, we are all one. At this stage in one's spiritual path, one is not so much discerning what God’s will is, as one is learning to live in alignment with the vibration of Love in all things. We may no longer ask what Scripture says because we are listening to what the Divine within our heart says. We may no longer listen to what the Church says because we are following where compassion leads.Finally we seek not only our own highest good, but humanity’s and creation’s highest good. Sadly, we can’t skip stages in our spiritual growth. But as we grow, discernment goes from an “outside” discernment/guiding to an “inside” knowing/alignment. When in alignment we feel who needs our attention and love… we feel when a relationship is healthy or not… we feel what is in line with our authentic self. We may not always follow through on what we feel, but we know the best and highest thing to do.